Before you raise your eyebrows, let me say this: Chronic City is a book with no real plot, but somehow it works. The lack of plot is almost the point. 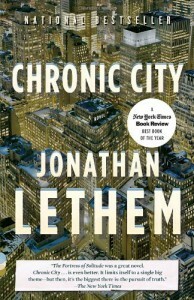 Chronic City is Jonathan Lethem’s newest novel, eagerly devoured by the many lovers of Fortress of Solitude. I never actually read Fortress, but I did read and really enjoy Motherless Brooklyn. I was a little wary of Chronic City, wondering if I as a non-smoker (of any substance) would really be able to appreciate it. Curiosity convinced me to pick it up anyway. Sometimes it’s good to get out of your comfort zone. So I read Chronic City, which is the story of former child star Chase Insteadman, jobless but living comfortably, a permanent fixture of New York’s social circuit, continuously pretending to pine for the stranded astronaut fiancée he barely remembers. Enter Perkus Tooth, a peculiar self-appointed music and movie critic who seems to only consume weed, coffee and bagels. And this is where I run out of explanation. Don’t get me wrong, a lot of things happen in this book – it’s just hard to isolate a single narrative thread. 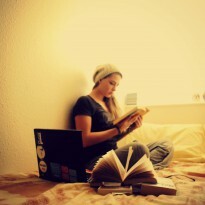 It’s more like a tableau of the people and places and things that populate Chase Insteadman’s seemingly pointless life. And, weirdly enough, that seems to be the point. Chase’s life is pointless. That’s the point. New York is coming down around his ears and every other character has a mission to complete, but Chase simply floats along, a footnote in everyone else’s story, living life on pause while Janice is stranded in outer space. This is a deeply weird book. It probably makes more sense if you’re high. That being said, I did enjoy it. Lethem has an uncanny ability to describe things in unexpectedly accurate ways, and his sense of humor often zaps you like a bee sting when you’re not quite ready for it. “Hark!” said Perkus. When he spoke the hiccups emerged as silences, but when he was silent they took the form of these Shakespearean exhortations. I won’t give away the end, but the story does get suddenly serious. It’s almost difficult to grasp, but what Lethem seems to be saying is: Everything you think you know about New York (and possibly your life) is a lie. Now what are you going to do about it?